Wondering what's running through your interviewer's mind? Here are 10 things your interviewer might be thinking-but probably won't tell you:1. You showed up too early. Many interviewers are annoyed when candidates show up more than five or 10 minutes early, since they may feel obligated to interrupt what they're doing and go out to greet the person. Some feel guilty leaving someone sitting in their reception area that long. Aim to walk in five minutes early, but no more than that. 2. We're judging how you're dressed and groomed. In most industries, a professional appearance still matters. You don't need to wear expensive clothes, but showing up in a casual outfit or clothes that don't fit properly, having unkempt hair, or inappropriately flashy makeup can harm your chances. 3. We don't want you to try to sell us. It's a turn-off when a candidate seems overly focused on closing the deal, rather than on figuring out if the job is the right fit. No hiring manager wants to think she's being aggressively sold; we want the best person for the job, not the pushiest spiel. 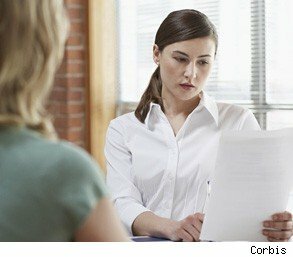 Candidates often act as if only "official" contacts, like interviews and formal writing samples, count, but hiring managers are watching everything, including things like how quickly you respond to requests for writing samples and references, whether your email confirming the time of the interview is sloppily written, and how you treat the receptionist. 5. We might act like we don't mind you bad mouthing a former employer, but we do. We'll let you talk on once you start, but internally we're noting that you're willing to trash-talk people who have employed you in the past and are wondering if you'll do that to us too. What's more, we're wondering about the other side of the story-whether you're hard to get along with, or a troublemaker, or impossible to please. 6. You might be talking too much. Your answers to your interviewer's questions should be direct and to-the-point. Rambling and unnecessary tangents raise doubts about your ability to organize your thoughts and convey needed information quickly. If you're tempted to go on longer than two minutes, instead ask, "Does that give you what you're looking for, or would you like me to go more in depth about this?" If the interviewer wants more, she'll say so. 7. Fit really, really matters, so we think a lot about your personality. You might have all the qualifications an employer is looking for, but still not get hired because your working style would clash with the people with whom you'd be working. Remember, it's not just a question of whether you have the skills to do the job; it's also a question of fit for this particular position, with this particular boss, in this particular culture, and in this particular company. 8. We want you to talk about salary first for the exact reason you fear. Salary conversations are nerve-wracking for job seekers because they know that they risk low-balling themselves by naming a number first. And that's exactly why interviewers push candidates to throw out a number first. In an ideal world, employers would simply let candidates know the range they intend to pay, but in reality, plenty take advantage of the power disparity by making candidates talk about money first. 9. We're going to ask other people what they think of you. We're going to ask anyone who came in contact with you for their impressions-from the receptionist to the guy who you met for two minutes in the hallway. 10. We like thank-you notes, but not for the reason you think. Post-interview thank-you notes aren't just about thanking the interviewer for her time; the ones that are done well build on the conversation and reiterate your enthusiasm for the job. Alison Green writes the popular Ask a Manager blog, where she dispenses advice on career, job search, and management issues. She's also the co-author of Managing to Change the World: The Nonprofit Manager's Guide to Getting Results, and former chief of staff of a successful nonprofit organization, where she oversaw day-to-day staff management, hiring, firing, and employee development.